The Beriman River is one of the last uncharted wild water rivers on the planet and it really lives up to its nickname—the Grand Canyon of the South Pacific: From its source in the remote Nakani mountains the river carves its way down 1,000 m in altitude, plunging down massive waterfalls and roaring through 13 narrow gorges to the Salomon Sea. 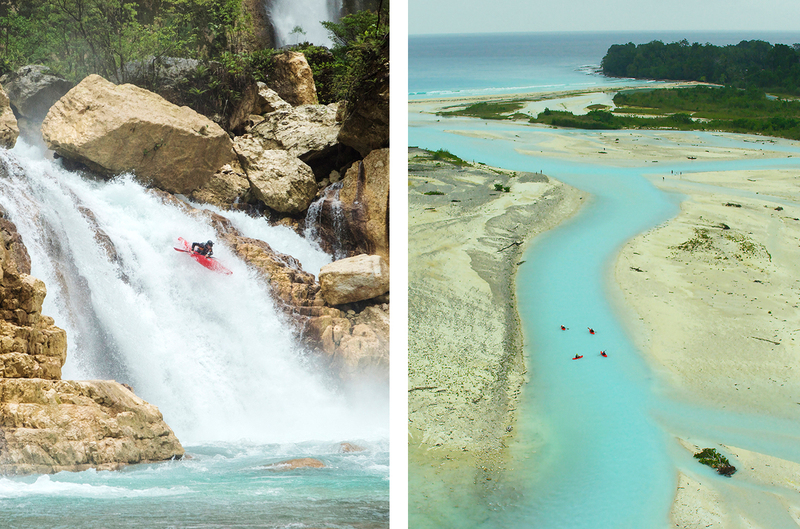 In June 2015 four kayakers attempt the impossible and take on the unprecedented challenge of paddling the Beriman. The only way out is through: The Beriman river has carved its way deep into the rock faces in the Nakani mountains of Papua New Guinea. Three men stand in the pouring rain on an overhanging rock ledge. The Beriman river thunders beneath them. In a united effort they haul up the rope, to which their paddle buddy Pedro Oliva and his kayak were attached just moments before: The rope is severed and Pedro is gone! The three kayakers look at each other in disbelief, panicking. They peer over the edge where the drama unfolded just a few seconds ago: As Pedro abseiled down to the river, the rope catches a carabiner holding his kayak. Trapped by the currents Pedro capsizes. Pushed against the walls of the narrow gorge and he desperately searches underwater for his knife. In the nick of time he finds it and cuts the rope loose to save himself. “This was definitely the most extreme kayak expedition, we have done!”, says kayaker Chris Korbulic in hindsight. “Almost the biggest challenge for me was just getting started. Committing to start the whole thing! The hardest part was just saying YES and not turning around and walking away.” And they almost did turn around around, because upon their arrival in the heart of Papua New Guinea the heavens open—days on end of pouring rain. Their goal to be the first kayakers to paddle the 13 steep gorges of the Beriman to the sea seems out of reach. “If a flood had happened while we were inside one of those gorges, it would have been game over”, Chris states. 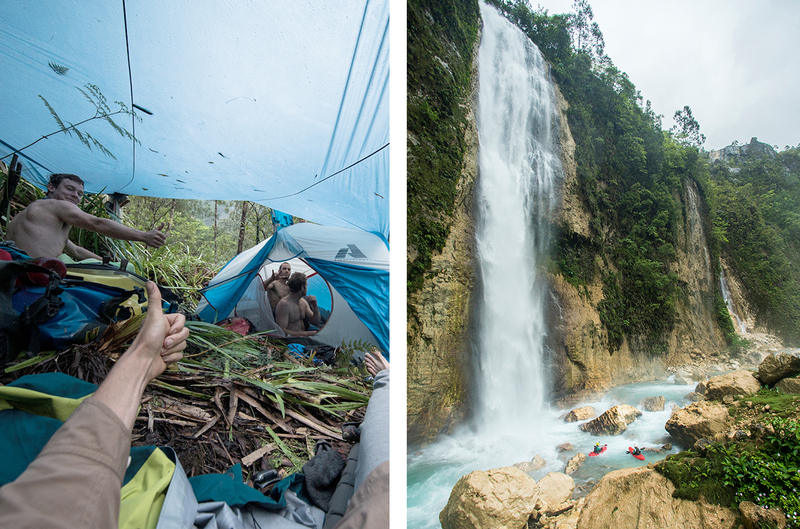 On the Beriman expedition the team face gigantic waterfalls, dangerous rapids and exhausting jungle portages. After 13 intense days the kayakers reach the open ocean. 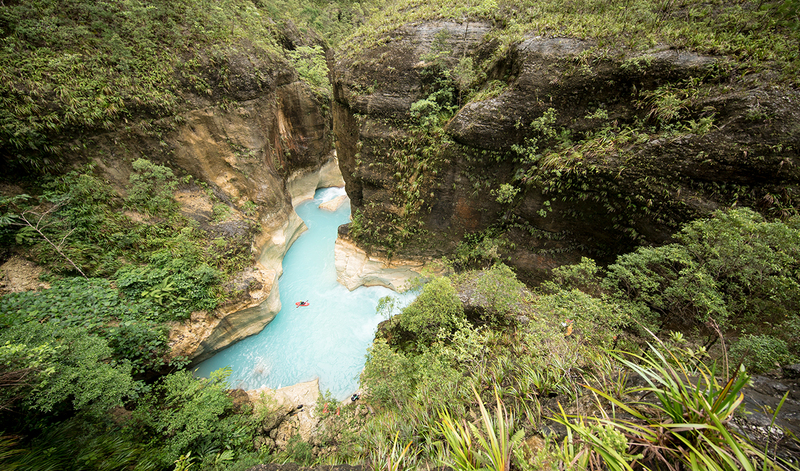 In the middle of the jungle on the island of New Britain lies the “Grand Canyon of the South Pacific”. The Beriman River flows from its source in the Nakani mountains to the Salomon Sea. Heavy jungle portages, gigantic waterfalls, treacherous rapids: it’s not easy to keep the spirits up all the time. But the portages aren’t the only price to pay. The river is relentless as well, challenging the team with class V white water: extreme rapids, narrow passages and steep falls of the hardest white water category out there. The narrow gorges are incredibly dangerous and unpredictable. 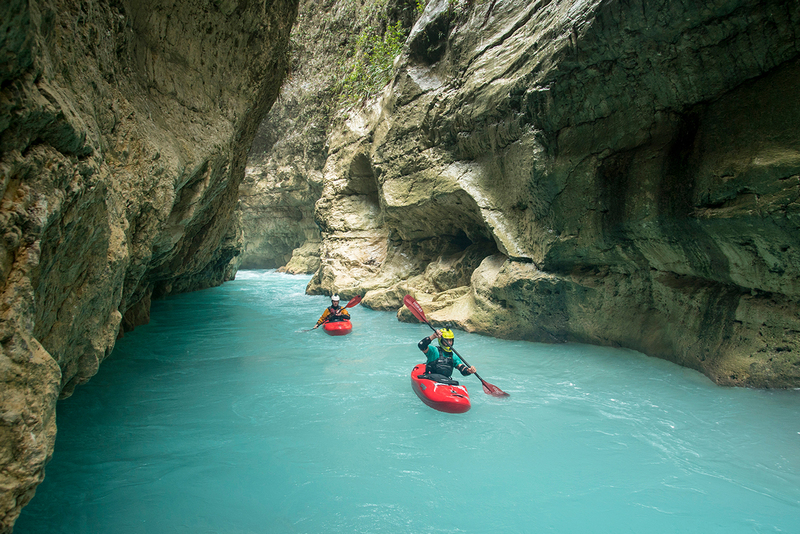 “One of the keys to being able to paddle this river was having flown over it. Aerial scouting meant we knew places where the river was possibly going underground. So we didn’t have to deal with the fear of coming around a corner to see the river disappearing. That would be totally scary, so we made sure we didn’t have to deal with that situation,” Chris says. Chris Korbulic during one of the many portages in the Beriman Gorge. The team had to fight through thick jungle, dragging and carrying their kayaks along for days to circumnavigate the most treacherous parts of the river. Before long the jagged rock faces along the Beriman have dissolved into soft banks of vegetation. Just a couple dozen paddle strokes and then—The Pacific Ocean! The kayakers take a deep breath, smell the fresh salty air and get emotional reflecting on what they have achieved. Deeply moved and incredibly happy Chris, Ben, Pedro and Benny paddle from the Beriman straight out to sea. They made it. After 13 days full of uncertainty, misery and fear. After many hours of pure adrenaline, hope and euphoria. The kayakers lean in for a hug and cheer for each other. Chris’s feet feel like they’re on fire. It will take a couple of days ‘til he is able to walk in shoes again. But right now he doesn’t care.